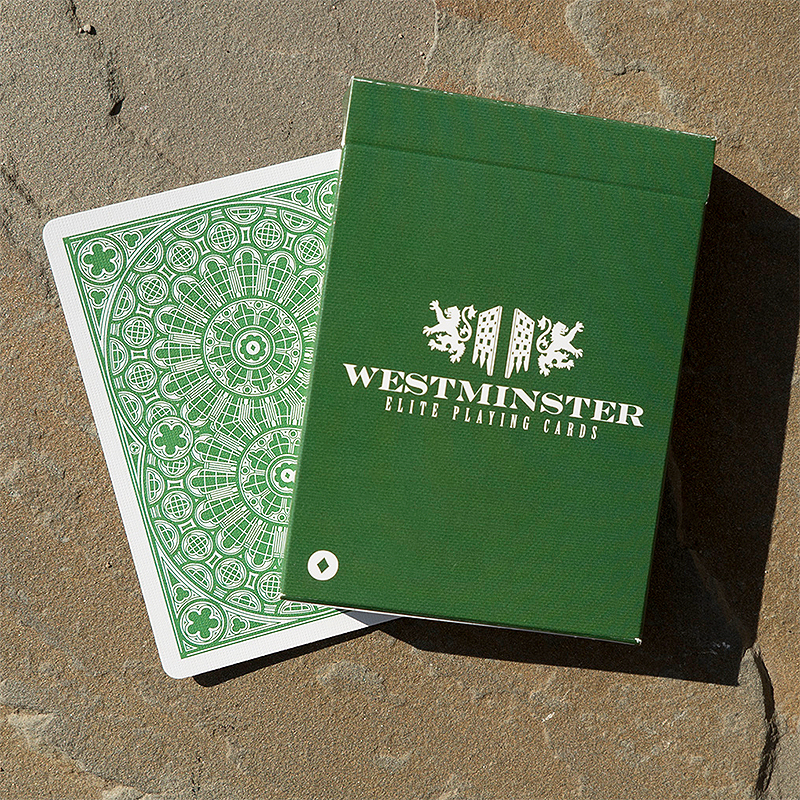 Westminster playing cards are the ultimate collaboration between England and the US. Designed by Phill Smith (creator of Stegosaurus and the DMC Black/Gold Marked deck), the Westminster deck is inspired by the gothic architecture of Westminster Abbey and offers a timeless look combined with a premium feel. Printed by USPCC on high-end Bicycle stock with top-of-the-line finish, traditionally cut, and with metallic green ink on the back design, these cards are just as amazing to handle as they are to look at. The deck features a custom Ace of Spades, custom gargoyle jokers with a built-in reveal effect, as well as a duplicate 2H and a versatile gaff card. Classic enough for any poker table or magic routine, yet beautiful enough for cardistry with its intricate design and metallic backs, this is a deck that you will love to use! - Limited 1st Edition. - Designed by Phill Smith. - Custom Back Design in Green Metallic Ink. - Custom Ace of Spades. - Custom Gargoyle Jokers with Reveal Effect. - High-Grade Bicycle Stock & Magic Finish, Printed by USPCC. - Traditionally Cut for Easy Shuffling. - Duplicate Card and Gaff Card Included. • The cards are poker size.